Did you know that in the first written version of Goldilocks And The Three Bears, by the British author and poet Robert Southey, published in 1837, the central character was not a little girl but an unpleasant and malicious old women - a vixen of sorts? The story at the time bore the title of The Three Bears. It was in 1849 that Southey's intrusive old women became an intrusive girl, who bore various names referring to her fair hair. The name Goldilocks was settled upon in the early Twentieth Century. It would seem that children favoured a pretty, naughty girl to an ugly, old hag and I do believe that book illustrators enjoy portraying Goldilocks who fares well in most versions of this story in contrast with the original vagrant woman. I found myself drawn to this inquisitive child with her short, curly blond locks and was quite smitten with her red shoes! 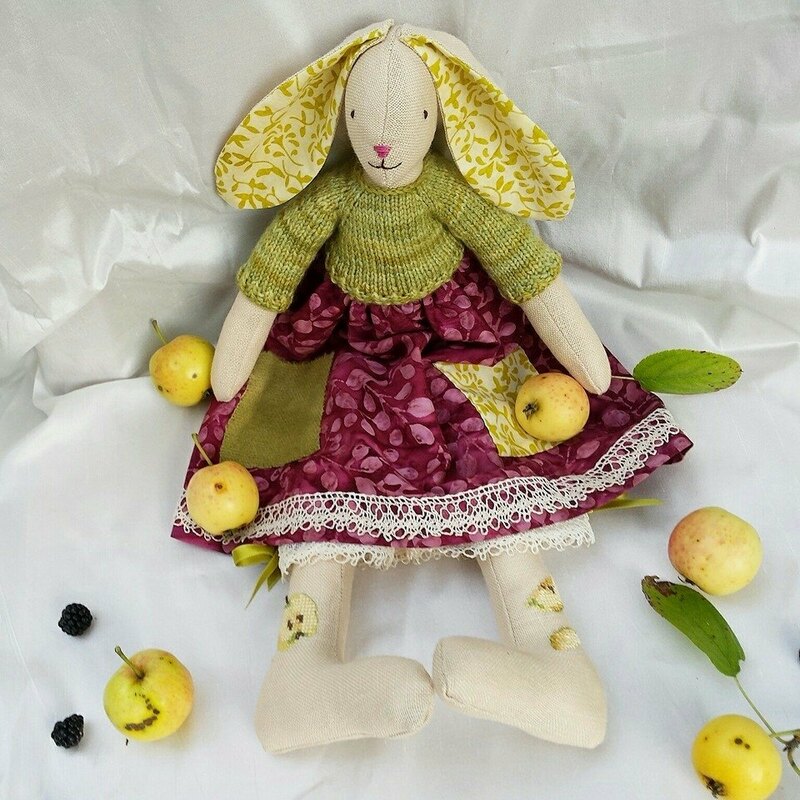 One day, by chance, I found a fabric, named Storybook Lane, which shared many of the same colours and details as Gastaut's illustrations of the forest in which Goldilocks wanders and I knew I had to make my version of this little girl, a doll, of course. High-spirited, a lover of flowers, and a little naughty too. Please meet my Goldilocks who, though very different from Gastaut's, is clad in the same vibrant colours. I had so much fun creating this small girl picking flowers in the forest, straying further and further away from her cosy home. But she hasn't met the three bears yet. I think I might have to make another doll wearing different clothes and colours inspired by the bears' cottage. Her Mary Jane shoes are fashioned from pure wool felt in cherry red and clinched with heart buttons. Her celadon-blue pinafore has a sprinkling of hand-embroidered daisies and simple flowers and her white lawn bloomers are trimmed with French pink lace. Although I am very fond of her I have slipped her into my shop for a few days. So, if you would like to give a home to a courageous, sweet girl who is happiest when skipping amongst the trees and filling her basket with wild flowers, you may find her here. Of course I would love to know whether you have a favourite fairy tale or Illustrator? I am very fond of The Snow Queen and The Twelve Dancing Princesses. I wish you all a wonderful weekend and thank you so much for taking the time to read my words. I truly appreciate it. Few words today, friends. Yesterday Héloïse went to school, her heart in her mouth, to find out her Baccalauréat examination results. Would you believe she scored a general average of 19.23 out of 20? Not only did she obtain the highest marks in the school - Mention Très Bien + avec Félicitations du Jury - but is believed to be in the top hundred in France. Heartfelt hugs were shared with so many teachers and I must confess I cried with shock and delight right there in the middle of all those anxious pupils and parents. We arrived home in the early hours of this morning after celebrating with friends my beautiful daughter's success but now, unfortunately, Héloïse is nursing a very painful throat. She really needs to rest after the past few weeks of strain, I believe. Although it is now high summer and porcelain pink Pierre Ronsard roses are gracing local high walls, paying tribute to our local Renaissance poet, I have been inspired by the exquisite apple blossom wreath which sweet Michele created for me. Do you recall the crown of wild violets Angélique was wearing in early spring? Michele's work is truly lovely and one flowery wreath never seems to be enough! This artist's home overlooks a beautiful apple tree orchard which, in late spring, is cloudy with the frilliest, candiest of all pinks and creams. I think she has captured the magical beauty of blossom to perfection; don't you? In my formidable yarn stash a few delicious skeins of silky alpaca Old Maiden Aunt sport weight in a peachy hued Blossom colourway were begging to be turned into a simple, delicate top. Leah Thibault's Sakura Cardigan was deemed the perfect pattern. * Peaceful knitting with the rustic luxury of Old Maiden Aunt to accompany me during the intense few weeks in late spring and early summer. My Ravelry notes may be found right here. The school summer holidays have started today and we are all more than ready for them. We will be around over the course of July, greeting friends into our humble home, and away in August to Brittany. I'd love to learn about your hopes and dreams for this summer! * We'll never forget our sweet Sakura.